Discover the best of the Peruvian Andes and the Galapagos Islands with this amazing tour package across Ecuador and Peru. Start off your adventures in Cusco, considered to be the most impressive pre-conquest city in the Americas, where you will enjoy both pre-Hispanic and colonial architecture in the city that served as the capital of the Inca Empire. Once you have had your fill of Cusco, you will continue to Machu Picchu, one of the New Seven Wonders of the World, and sure to be one of the many highlights of your trip. During your time in Peru, you will also visit numerous Inca archeological sites and towns within the Sacred Valley of the Incas and Cusco. Next you will head north to Quito, the colonial capital of Ecuador, with one of the most beautiful historic city centers in South America. From here you will set off for the remote Galapagos Islands, isolated nearly 600 miles (1,000 km) off of Ecuador’s coast. On the Galapagos Islands, you will be amazed by the unending natural wonders, both on land and in the sea, that you will enjoy during your relaxing cruise. Giant tortoises grunt in distant highlands, prehistoric marine iguanas hiss and spit sprays of salt, pink flamingos adorn the shores of hidden lagoons, flightless cormorants and tiny penguins dart amongst colorful schools of fish, while elegant tropical birds glide through deep blue skies. All this and more awaits you during your unforgettable trip through Peru and Ecuador. Upon arrival to the Lima airport, a Peru for Less representative will meet you and show you to your airport hotel. Make your way to the airport for your morning flight to Cusco. Your airport hotel is within walking distance of the departure terminal. The city is located at high altitude, so you may want to spent the remainder of the day acclimatizing. Once you have adjusted to the altitude, Cusco has many options for casual and fine dining. In the afternoon, an expert guide will take you to many of the amazing archeological sites in and around the city, including the Cusco Cathedral in the Plaza de Armas, the Temple of the Sun or Qoricancha, and the ruins of Sacsayhuaman, Q'enko, Puka Pukara, and Tambomachay. Explore the beautiful Peruvian countryside with a full-day tour of the magical Sacred Valley. First, you will visit the town of Pisac, famous for its bustling market and beautiful Incan ruins that loom over the city. In the market you will have the opportunity to browse the beautiful handicrafts and Andean garments displayed for sale, as well as local fruits, vegetables, and other natural products. While at the Pisac ruins, you will be able to see ceremonial and cementary areas, as well as take in amazing views of Pisac and the surrounding valley. At the end of the tour, you will be taken to your comfortable hotel in the Sacred Valley. After breakfast at your Sacred Valley hotel, you will take a train to Machu Picchu, the hidden Inca citadel. The train ride is an attraction in itself. Much of the path winds along the rushing river and snakes past steep mountain faces, offering passengers dramatic views of the Andes landscape as it descends from the high altitude plains to the cloud forest. The foliage dramatically changes as the train approaches the meeting point of the Andes and the Amazon rainforest, providing visitors with a real sense of Peru's diverse geography. Upon arrival in Aguas Calientes, the town near Machu Picchu, you will be met at the train station and accompanied to the bus station for a 20-minutes ride up to the secluded citadel. Next, meet your expert English-speaking guide for a 2-hour tour of the most important sites in Machu Picchu, including the Intihuatana (the "hitching post" of the sun), the Sun Temple, and the Room of 3 Windows. You will be able to appreciate the intricate stonework and awe-inspiring setting of this amazing site. After your tour, you will be able to explore more of the ruins on your own and capture some final photos. *Optional: Hike up Huayna Picchu, the peak overlooking the Machu Picchu ruins. This hike is steep and takes about 3 hours round trip, but has remarkable views. Please let your Travel Advisor know if you'd like to add this to your itinerary. 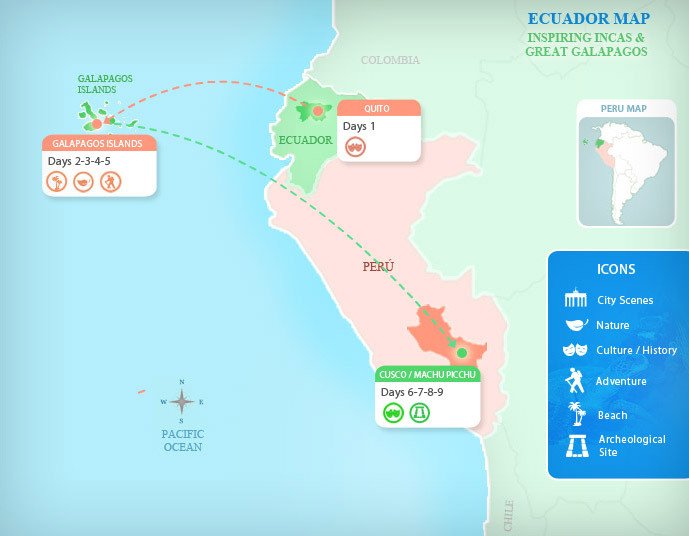 After breakfast, meet your transfer to the Cusco airport for your flight to Lima and then on to Quito, the capital city of Ecuador and transit hub for Galapagos travel. In Quito, you will be picked up at the airport and taken to your comfortable Quito hotel. The transfer time from the Quito airport to most hotels is between 1 hour and 1 hour and 30 minutes. Once you are settled in your Quito hotel, you will receive a briefing for your Galapagos cruise. You will have the remainder of the evening free so that you can rest before your next exciting adventure. Your Galapagos experience starts with an early breakfast at your hotel and transfer to the airport for your flight from Quito to the Galapagos Islands. Upon arrival at the Baltra airport, you will be met by a representative and taken to your confirmed Galapagos cruise ship. After checking in, you will receive an on-board briefing by the cruise staff and enjoy a delicious welcome dinner to start off your exciting Galapagos adventure. Explore the wonderful Galapagos Archipelago aboard your comfortable cruise ship. Your exact itinerary may vary depending on your cruise ship, however, you will be able to visit some of the most beautiful islands of the archipelago and enjoy land tours with expert naturalist guides. Depending on your ship, you may also be able to enjoy water activities, such as snorkeling or scuba-diving. The Galapagos Islands offer some of the best wildlife viewing in the world, not only because the animals themselves are beautiful and interesting, but also because many of the species are virtually fearless. Through a quirk of evolution, large predators failed to evolve here, resulting in a unique sense of security in the island's inhabitants. This means that the famous blue-footed booby may perform its awkwardly elegant two-step mating dance right under your nose, oblivious to your camera, mockingbirds might hop right onto your shoes, or you could watch sea lions perform figure eights to show off their swimming prowess as you snorkel nearby. This morning you will return to land to meet your transfer to the airport from your flight to mainland Ecuador and journey home or to your next destination. Alternatively, browse our full range of Ecuador tour destinations to continue exploring the Galapagos or visit other incredible locations in Ecuador. This 5-star luxury Quito hotel is conveniently located only 20 minutes from the Quito airport and a 10-minute walk from the city's historic center. This fully-equipped and elegant hotel is perfect if you are looking to pamper yourself and enjoy a carefree vacation. Relax in the fitness center, spa, or swimming pool, and treat yourself to a delicious meal in one of the hotel's five exquisite restaurants, or simply rest in your modern and luxurious room. All rooms and suites are stylishly decorated in a contemporary fashion and provide spacious areas for you to relax in style. This new luxury boutique Quito hotel is probably one of the best hotels in all of Ecuador. The elegant hotel successfully combines contemporary and traditional Ecuadorian styles, giving it an air of authenticity while offering great comfort and stylish décor. As a reminder of the city's fascinating and complex history, each room is uniquely decorated to emphasize different elements of Ecuador's cultural heritage. The hotel's architecture, however, focuses on simplicity with a carved wood and stone center bringing an air of serenity to the entire place. Enjoy instant relaxation in the hotel's wellness zone equipped with a Jacuzzi, hammam, and massage room. Located in Quito's newest commercial district and inside a majestic renovated colonial house, the Hotel Vieja Cuba comprises 26 rooms offering all the amenities that comfortable modern life requires. The stylish rooms, with their wooden furnishings and warm colors, are cozy and create a peaceful haven where guests can rest after a long day of sightseeing. The 3 restaurants and the coffee-bar are all characterized by the distinctive touch of the various chefs who manage to exquisitely combine African, French, Spanish and Chinese influences into a delicious Cuban gastronomy. The Galapagos Journey I is a luxury power catamaran offering high quality and comfortable cruises in the Galapagos Islands since 2006. The boat comprises 6 twin bed cabins and 2 suites equipped and decorated with the highest standards in mind. The M/C Galapagos Journey I is a very spacious yacht with larger-than-average inside and outside social areas. The Catamaran has lots of open deck space allowing guests to make the most of the natural wonders of the Galapagos Islands. It is also offers a wide range of activities such as snorkeling, sea kayaking, and excursions with a naturalist multilingual guide. The Galapagos Grand Odyssey is a brand new luxury yacht, offering the highest level of comfort of any boat its size in the Galapagos Islands. Its features resemble but also surpass those of the already highly praised Odyssey I. Among the amazing features of this boat are a sundeck where guests can enjoy the spectacular views, a Jacuzzi, a restaurant and bar, gym, and mini-spa. Enjoy the paradise of the Galapagos Islands while navigating in this 114-passenger luxury expedition Galapagos cruise ship that was totally renovated in December 2001. The Galapagos Legend has all-new passenger accommodations with 1,800 square meters of social areas. Built with marine-certified materials that fulfill Safety of Life at Sea specifications, you will be well cared for on this beautiful vessel. The brand new Aranwa Boutique Hotel, opened in October 2010, is operated by Aranwa Hotels Resorts & Spas, one of the most luxurious hotel chains in Peru, known for their careful attention to their clients' well-being. Probably the best value luxury accommodation in Cusco, this elegant 5-star hotel is housed in a converted 16th-century mansion and is decorated with colonial era furniture, impressive paintings from the Cusco school, and colonial gold-leaf plated carvings and sculptures. Located in the historic artisan’s quarter of San Blas, this boutique hotel is privately situated, but still close to restaurants, bars, artisan workshops and galleries. Only two and a half blocks from the central Plaza de Armas, the Boutique Hotel Casa San Blas is near all the main attractions in Cusco, but provides the peace and tranquility guests look forward to after a long day exploring Inca ruins. The Inkaterra Machu Picchu Pueblo Hotel is a naturalist’s haven. Conveniently nestled in the verdant Andean cloud forest, this lovely hotel is the perfect place to catch a glimpse of the astonishing flora and fauna of the region. The eco-friendly hotel resembles an Andean village and is comprised of charming white-washed cottages decorated with modern indigenous art as well as authentic pre-Columbian artifacts. Travelers looking for convenience and a touch of luxury during their Machu Picchu travels will be pleased with this excellent hotel. Situated just 200 meters from the train station this wonderfully appointed establishment boasts 31 fully-equipped and tastefully decorated rooms. Each accommodation features wooden furnishings, a large bed covered with comfortable bed linens, and some rooms even feature breathtaking views of the river. Built on a seventeenth century colonial hacienda, along the tranquil banks of the Vilcanota River, the Aranwa Sacred Valley Hotel is the picture-perfect place for a countryside retreat. The hotel showcases a fusion of minimalist and colonial style rooms and buildings, all surrounded by sweeping views of the breathtakingly beautiful Sacred Valley. A prominent member of the Casa Andina chain, the Private Collection is a luxurious hotel, comfortably nestled in the heart of the Sacred Valley only 10 minutes from the ruins of Ollantaytambo. Combining relaxation in its luxurious spa with sports activities such as bike riding or hiking, this excellent and all encompassing hotel has something to suit everyone's taste. The hotel also features a delicious restaurant, playgrounds, a jewelry store and an on-site observatory allowing guests to admire the beautiful star-filled Andean sky. Experience the "Southern Valley" of Cusco with an expert guided tour of Tipon, Piquillajta, and Andahuaylillas. At Tipon, you will discover a remarkable and extensive Inca site famous for beautiful gardens irrigated with fresh, cool water that runs through an intricate system of fountains. Piquillajta, the "City of Fleas", is an impressive and ancient Wari ruin built in the first century. Here you’ll explore this administrative capital of the southern portion of the Wari Empire which dates back to pre-Inca times. You will also visit the small village of Andahuaylillas, home to a dazzling 17th-century church, known as the "Andean Sistine Chapel". Built upon the site of an old Inca temple, the church’s altar is gilded in 24-carat gold leaf and adorned with both Christian and Quechua symbols. Included: Transfer to/from Cusco, expert English-speaking guide and entrance tickets to Tipon, Piquillajta and Andahuaylillas sites. Enjoy a horseback riding adventure across the Sacred Valley to Maras Salt Mines and the Moray agricultural terraces. The tour starts with a pickup from your Cusco hotel and a transfer to the Sacred Valley, about 2-hours from Cusco by car. Here you will start your exploration on horseback. You will cross a bridge over the Urubamba River and head uphill out of the Sacred Valley. During the uphill portion you will ascend over 1,300 feet out of the Sacred Valley and into the mountain plains, this portion will take approximately three hours with stops along the way to enjoy the views. Next you will arrive at Moray, home to circular agricultural terraces and believed to be a horticultural experimentation center. Each terrace level represents a different altitude and climate zone, allowing the Incas to develop crops that could be grown in a variety of locations. You will explore Moray with your guide before continuing on to Maras. In the village of Maras you will stop for a picnic lunch before riding to the Maras salineras (salt ponds). Here naturally salty spring water flows into polygonal-shaped pools, dries in the sun, and is then collected and packaged. You will tour this site with your guide to learn more about the history and how it is used today. After this visit, a vehicle will meet you for your transfer back to Cusco by car. The experience will last between 7 and 8 hours, with approximately 4 hours of riding time. Included: Transfers to/from Cusco, English-speaking guide, picnic lunch and entrance tickets to Maras and Moray sites. Located between Ollantaytambo and Machu Picchu, the campsite is situated at 2800 meters a.s.l. and is close to the Vilcanota River. From here you can see the archeological site of Ollantaytambo, just a 30 minute walk from your campsite. The following day, you can walk to the train station, only 15 minutes away, and take the train to Machu Picchu. The campsite is accessible by road, by rafting on the river Vilcanota or by trekking. The tour will take place in the Sacred Valley, located about 1 hour and 30 minutes outside of Cusco by car. You will spend approximately 2-hours on the river, and will be able to see the beautiful Sacred Valley from a different perspective. After the tour, you will have lunch before returning to Cusco by car. The entire experience will last between 5 and 6 hours. Included: First-aid kit, bilingual guide service, canoeing kit, life-jackets, oars, waterproof pants, and transportation to and from the Sacred Valley. If you aren't afraid of heights and are looking for a unique adrenaline-filled adventure, this Zip Line and Mountain Climbing tour is for you! You'll start with a transfer from your Cusco hotel to the Sacred Valley, approximately 2-hours by car. Next, the adventure begins with mountain climbing up the rock formations that make up the hillsides of the Sacred Valley. Here you will use a helmet, harness and permanent cable system to safely climb with your expert guide. During this portion of the tour you will ascend nearly 1,000 feet (300 meters) and enjoy amazing views as you climb. Once you reach the highest point of the climb, you will start to descend into the valley - this time on a series of zip lines. There are a total of 6 zip lines, each ranging between 300 and 1,500 feet (100 to 500 meters) in length. Expert guides and all necessary safety equipment will ensure your security and fun during this adventure. The entire experience will last between 7 and 8 hours, with approximately 4 hours spent on the Zip Line and Mountain Climbing. Please note that this tour can be physically demanding and travelers should be in good physical condition, particularly for the climbing portion of the tour. This tour is not recommended for travelers who are uncomfortable with or have a fear of heights. Included: Equipment, bicycle, helmet, gloves, first-aid kit, English-speaking guide, picnic lunch and entrances to Maras and Moray sites. *Note: Pricing is per person and based on a private tour with a minimum of two travelers. For single traveler pricing or group tour options, please consult with a Travel Advisor. Head off the beaten path to two unique sites located between Cusco and the Sacred Valley, Maras and Moray. First, Moray, this Inca archeological site is the oldest known horticultural experimental center in the world. Each terraced level has a different micro-climate in which different crops can be grown. The circular terraces descend to 492 feet (150 meters) and the temperature difference between the upper and lower terraces is up to 59F (15C). For those up for a little effort, you can climb down to the lowest level to get a true sense of the magnitude of the site - just be prepared for the hike back up! Next, Maras is located about 4 km from Moray, and is the site of pre-Inca salineras (salt ponds). Each terraced pond is polygonal in shape; salty water emerges from an underground spring, flows into the ponds, and evaporates in the sun. The Maras salt mines are still active today and maintained cooperatively by the Maras community. The white salt ponds contrast with the green hills and mountains that surround the mines and the views of the Sacred Valley from here are amazing. The tour starts with a pickup from your Cusco hotel, and the entire experience lasts around 5-hours. You will return to your Cusco hotel by early afternoon. During the horseback ride you will pass by traditional adobe homes and small Andean villages. You will ride up to Chacan, where you can enjoy a small waterwall and unique rock formations before continuing on to the ruins at the Cusilluchayoc Temple. Along the way the beautiful and varied landscape will impress you as you catch glimpses of the city of Cusco from above. At the end of the tour, you will meet your vehicle for your transfer back to Cusco. The entire experience lasts approximately 5 hours, with 3 to 4 hours of riding time. Included: Transportation to/from Cusco hotel, English-speaking guide, and picnic lunch. Included: a Pisco Sour (or non-alcoholic beverage) as well as a choice of appetizers, main dishes, and desserts. Vegetarian options are available. Not Included: Other beverages, tips, transportation to/from the restaurant, however, the restaurant is located within walking distance of most hotels in Cusco. During this ceramic class at Muña Restaurant in the lovely Sacred Valley you will learn the basics of Peruvian pottery and make your own piece to take home. A prestigious Peruvian ceramic artist will walk you through the entire process from preparing raw clay to learning traditional painting designs and methods. You will then use the techniques you just learned to create a one of a kind piece of artwork. This two hour class is a great introduction to Peruvian pottery and an ideal way to learn about the current and traditional art scenes in Peru.